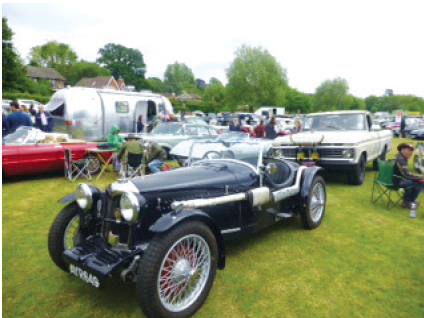 With an Elvis tribute act, Ghostbusters, radio-controlled fun cars, Punch and Judy and a host of vintage cars, the Staplefield Village Fete is back again this year, promising to be bigger and better than ever. The event takes place on the spring Bank Holiday Monday 28th May 2018 between midday and 4.30pm in the beautiful setting of Staplefield Village Green. This popular event has been a village highlight since the 1920s and draws people from near and far. The fete will open with a display of Maypole Dancing by St Mark’s School, and entertainment throughout the day will be provided by the fantastic big band sound of the Perdido Players. “Who you gonna call?” asked Maggie Chamberlain, Co-Chairwoman of the organising committee for the Staplefield Fete this Bank Holiday Monday 29th May. Well, the answer really was ‘Ghostbusters!’ this year. The Sussex Ghostbusters, a team of Ghostbusters super-fans kitted out with movie-accurate uniforms and equipment from the Ghostbusters movies, were there to raise money for local charities. The Ghostbusting crew along with ‘Philvis’, an Elvis impersonator, and MP Nicholas Soames rubbing shoulders with Baron Von Thunderclap from the Monster Raving Loony Party (both taking a break from election campaigning) were among the many wondrous sights to behold at this year’s annual Staplefield Fete and Car Show. The festivities started with a stunning opening from St Mark’s Primary School Maypole Dancers. This was followed by the ever-popular dog show, run by Kate Fassam from Raising Hopes Dog Training. This event is always well attended, with dogs coming from far and wide and in all shapes and sizes. This year cocker-poo Snoopy stole the highly-coveted title of Best in Show. This year’s fete raised an amazing £7,375.00 for St Mark’s School in Staplefield, St Mark’s Church and the Staplefield Village Hall. A huge number of people attended this year, and with rising numbers the organising committee is keen to hear from local businesses and entertainers that would like to be part of next year’s fete. Please contact Maggie Chamberlain (maggs49 @btinternet.com). One of the best and most traditional village fetes in Sussex looks set to attract crowds once again this Bank Holiday Monday, 29th May. Running alongside the fete is the Car Show which includes unusual exhibits and a range of classic cars. Food and drink on offer will include Pavilion teas and cakes, pulled pork, BBQ, Pimms, Prosecco and strawberries. For more information contact Maggie Chamberlain: maggs49 @btinternet.com, 01444 484825, or Tracey Millis: tracey @xtannersmead.fsnet.co.uk, 07538952835.